Today, I received the Cherry On Top Award from The Lady of Oslo. Go check out her blog. It's wonderfully diverse, informative and full of good music, clothes and coffee. Thank you so much, SP. I was just craving a glace cherry myself. On top of either an ice cream sundae or a cupcake. Three things I like to do! Champagne and Bubbles - fun, great shopping the countdown to a new life in Singapore! Best of luck, Bubbles! Motherhood, Career, Fashion - Brasilian_Babe, you have the most drool worthy accessories and accessible chic. And such a nice post! Thank you lovely. Such kind words. Congrats! 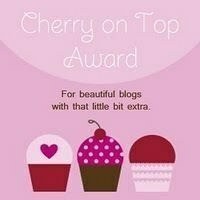 you have a great blog, well earned!